This chapter provides a basic overview of credit card securitizations. Subsequent chapters go into more detail on the various concepts discussed here. Asset-backed securities (ABS) are bonds backed by financial assets, such as auto loans, mobile home loans, credit card loans, and student loans. In the case of credit card ABS, the bonds (referred to as certificates or ABS in this document) are backed by credit card receivables. While the process of securitizing loans has been around for over 30 years, the securitization of credit card receivables first began in 1987. Since then, the process and structure have evolved significantly, and credit card securitizations currently represent the primary funding vehicle for unsecured revolving consumer credit. Similar to mortgage and other asset securitizations, the financial institution that originates the credit card receivables sells a group of these receivables to a trust. The trust then creates and sells certificates backed by the credit card receivables to investors, which are predominately institutional investors. Very few credit card ABS are marketed to retail customers, primarily due to the complex nature of the transactions and the need to continually monitor various performance indices on the underlying receivables. The underlying credit card receivables generate income to support the interest payments on the certificates. Exhibit A depicts a basic set-up for a securitization. 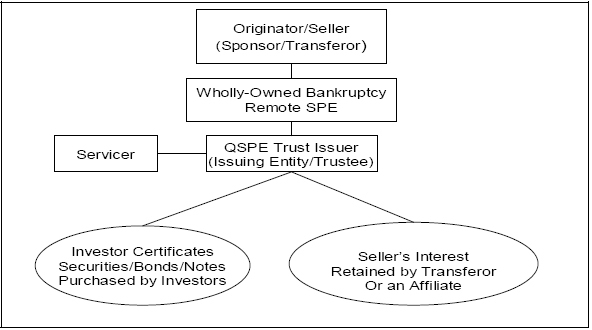 The securitization is created when the financial institution (originator/transferor/seller/sponsor) has accumulated a significant volume of credit card receivables (originated or purchased) and transfers these receivables to a wholly-owned bankruptcy remote Special Purpose Entity (SPE), which then transfers the receivables to a securitization vehicle (typically a QSPE trust). The trust then packages the receivables and issues investor certificates (sold to investors) and trust certificates (retained by the transferor or affiliate). Proceeds from the sale of the investor certificates go to the trust. The trust in turn pays the financial institution (seller) for the purchase of the underlying credit card receivables. The investor certificates noted in Exhibit A are typically issued with a senior/subordinated structure. The seller/originator often retains the bottom or most subordinated piece or pieces. 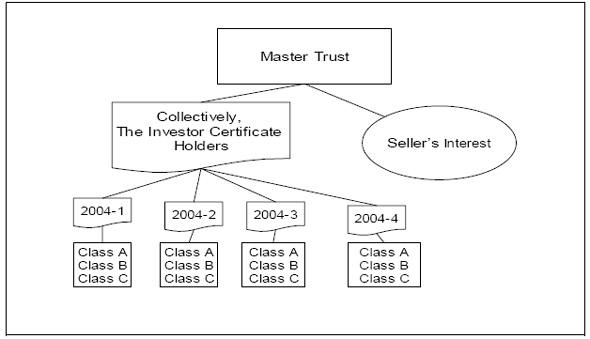 The trust certificates are also referred to as transferor's interest, seller's certificate, or seller's interest. The assets have been legally isolated. The transferor otherwise no longer maintains effective control over the assets. These control requirements are discussed in greater detail in the Accounting Chapter. In addition, the FDIC adopted a Final Rule on the Treatment of Securitizations and Participations Following the FDIC's Appointment as Conservator or Receiver (FIL-57-2000), which directly relates to the "legal isolation" concept. Examiners can review this document to gain a greater insight into the FDIC's position regarding this isolation test. In a credit card securitization transaction only the receivables are sold, not the accounts that generate the receivables. The financial institution retains legal ownership of the credit card accounts and can continue to change the terms on the accounts. Accounts corresponding to securitized loans are typically referred to as the designated accounts (or sometimes trust accounts). The initial outstanding balances on the designated accounts are sold to the trust as are the rights to any new charges on the designated accounts. Subsequently, as cardholder purchase activity generates more receivables on the designated accounts, these new receivables are purchased by the trust from the originating institution/seller/transferor. The trust uses the monthly principal payments received from the cardholders to acquire these new charges or receivables. When the securitization is initially set up, the originating institution/seller adds sufficient receivables to support the principal balance of the certificates plus an additional amount (seller's interest) that serves to absorb fluctuations in the outstanding balance of the receivables. The originating institution/seller will make subsequent additions to the trust in order to keep the seller's interest at the required level. The seller's interest is not always "certificated" as the terms seller's certificate or transferor's certificate often imply. In the past, institutions have stated that since the seller's interest represents seller's certificates it should be carried in the investment portfolio versus the loan portfolio; thereby, eliminating the need for an allowance for loan and lease losses (ALLL) against the seller's interest. However, the seller's interest piece does not represent a sale or financing since no proceeds were received for the transferred assets. Instead, the seller received an interest in the transferred assets and this interest should be reflected in the loan category on the financial institution's books. Credit card securitizations differ from other ABS since the underlying credit card receivables have a relatively short life, typically eight to ten months, supporting the outstanding certificates, which typically have three, five, or ten year maturities. As a result of this maturity mismatch, each series issued out of the master trust is structured to have a revolving period and a controlled amortization period or controlled accumulation period. During the revolving period, the cardholders make monthly principal and interest payments to the servicer. The servicer deposits the payments into two separate collections accounts, one for principal and one for finance charges. The trust expenses are paid, including interest payments on the investors' certificates, from the finance charge account. New receivables generated by the designated accounts are purchased from the originating institution/seller with funds from the principal account. The revolving period is for a predetermined period of time that is established at the time the series (often referred to as the "deal") is structured. Following the revolving period, there is a controlled amortization or accumulation period. During the controlled amortization period, the principal collections are used to pay down the outstanding principal amount of the investor certificates. During controlled accumulation, the principal payments collected are deposited into a trust account and reinvested in short-term investments. These short-term investments become the collateral for the outstanding investor certificates and increase as principal payments are received from the cardholders until the investments equal the amount of the outstanding investor certificates in the maturing series. The investments mature at the same time allowing the trustee to make a bullet payment to all the investment certificate holders. Most credit card ABS are structured using controlled accumulation and bullet payments. Since the designated pool of accounts remains part of the trust, the seller's interest grows during the amortization or accumulation phase. This is what is meant by the commonly used phrase "receivables come back on the books." The financial institution or seller does not actually bring the previously sold receivables on the books when the investor certificates mature or during the accumulation period. Instead, as noted, the principal payments received on the sold receivables are accumulated (invested) and ultimately used to payoff the outstanding investor certificates, while the new charges incurred on the designated accounts during the accumulation period become seller's interest since they are no longer collateral for the investor certificates and as such are reported as loans on the bank's books. Credit enhancements are required in order to receive higher debt ratings and thus improve marketability and financing costs. Credit enhancements can be either internal or external or a combination of both. The most common external credit enhancements facilities are cash collateral accounts, collateral invested amounts (CIA), third-party letters of credit, and reserve accounts. The most common internal credit enhancements facilities are senior/subordinated certificates, excess finance charges, spread accounts and over collateralization. These items are discussed in more detail in the Credit Enhancement Chapter. Credit rating agencies play a large role in credit card securitizations. The rating agencies determine the amount of credit enhancements required for specific credit ratings, the amount of seller's interest, and account eligibility. The seller can only designate accounts that meet transaction account eligibility requirements as dictated by the rating agencies. Since all series in a master trust benefit from their pro-rata undivided interest in a single pool of credit card receivables, the rating agencies perform their credit analysis on all of the credit card receivables in the master trust for each series issued. Since credit card issuers can add receivables to the trust and change the terms on existing receivables, the credit risk of the underlying collateral in the master trust can change over time. The rating agencies continually monitor the performance of the receivables in trust. Many financial institutions are issuing credit card ABS via complex structures. Bank One created its Bank One Issuance Trust in 2002. That trust accommodates the issuance of certificates on either a stand-alone basis, multiple series basis, or on a de-linked basis out of a single series, and also allows for the creation and subsequent issuance of certificates out of multiple asset pools. Financial institutions are also using collateral certificates, which allow the issuer to have some receivable and cash flow sharing between master trusts, such as when one financial institution acquires another institution that had its own credit card receivables and master trust. In addition, instead of issuing certificates that are fixed as to principal, credit card companies are issuing Variable Funding Certificates with provide for monthly principal settlement, which may increase or decrease the outstanding amount of the principal. This type of structure allows the banks to more efficiently respond to the seasonal fluctuations in funding requirements. As a result of banks' continuing incentive to improve funding access, efficiency, and costs, examiners need to stay abreast of the changing nature of credit card securitization structures. 2 Bernstein Research, "Credit Card Securitization: A Quick Primer," May 2002. 3 Financial Accounting Standards Board, "Statement of Financial Accounting Standards No. 140, Accounting for the Transfers and Servicing of Financial Assets and Extinguishments of Liabilities." September 2000. 4 Deutsche Bank, "The Essential Guide to Credit Card As, Bs, and Cs." January 2001.